With the rack in the middle position, preheat the oven to 200°C (400°F). 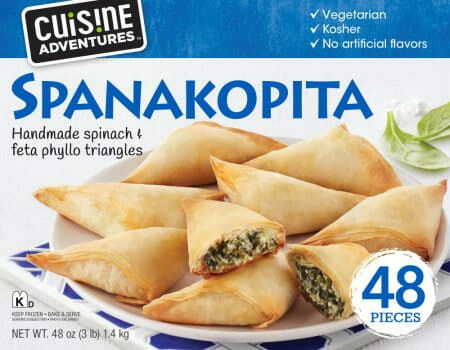 In a baking dish (9 x13) bake Spanakopita according to package instructions. Set aside. In a bowl, mix all ingredients for egg mixture together with fork or a whisk, to get a smooth creamy texture. Poor egg mixture over the cooked spanakopita. Bake until cheese is golden, about 10 to 15 minutes. Sprinkle with the feta cheese and baby spinach. Note: If using more than one tray of Spanakopita, egg mixture may be doubled.